THE GLASS TUBES OF NEON LIGHTS contain various gases that can be excited by electricity. Light is produced when electrically excited atoms return to their lowest-energy states. We learn that light (radiant energy, or electromagnetic radiation) has wavelike properties and is characterized by wavelength, frequency, and speed. We recognize that electromagnetic radiation also has particle-like properties and can be described in terms of photons, “particles” of light. We examine the light that atoms give off when appropriately stimulated (line spectra). Line spectra indicate that electrons exist only at certain energy levels around a nucleus and that energy is involved when an electron moves from one level to another. The Bohr model of the atom pictures the electrons moving only in certain allowed orbits around the nucleus. We recognize that matter also has wavelike properties. As a result, it is impossible to determine simultaneously the exact position and the exact motion of an electron in an atom (Heisenberg's uncertainty principle). We can describe how an electron exists in atoms by treating it as a standing wave. The wave functions that mathematically describe the electron's position and energy in an atom are called atomic orbitals. The orbitals can be described in a shorthand notation using quantum numbers. We consider the three-dimensional shapes of orbitals and how they can be represented by graphs of electron density. We recognize that the energy levels for an atom with one electron are altered when the atom contains multiple electrons. Each electron has a quantum-mechanical property called spin. The Pauli exclusion principle states that no two electrons in an atom can have the same four quantum numbers (three for the orbital and one for the spin). Therefore, an orbital can hold a maximum of two electrons. We learn that knowing orbital energies as well as some fundamental characteristics of electrons described by Hund's rule allows us to determine how electrons are distributed in an atom (electron configurations). We observe that the electron configuration of an atom is related to the location of the element in the periodic table. WHAT HAPPENS WHEN SOMEONE switches on a neon light? Electrons in the neon atoms are excited to a higher energy by electricity An electron can remain in a higher-energy state for only a very short time, and it emits light when it returns to a lower energy. The resulting glow is explained by one of the most revolutionary discoveries of the twentieth century—the quantum theory, which explains much of the behavior of electrons in atoms. In this chapter we explore the quantum theory and its importance in chemistry. We begin by looking at the nature of light and how our description of light was changed by the quantum theory. We will explore some of the tools used in quantum mechanics, the “new” physics that had to be developed to describe atoms correctly. We will then use the quantum theory to describe the arrangements of electrons in atoms—what we call the electronic structure of atoms. The electronic structure of an atom refers to the number of electrons in the atom as well as their distribution around the nucleus and their energies. We will see that the quantum description of the electronic structure of atoms helps us to understand the arrangement of the elements in the periodic table—why, for example, helium and neon are both unreactive gases, whereas sodium and potassium are both soft, reactive metals. Much of our present understanding of the electronic structure of atoms has come from analysis of the light either emitted or absorbed by substances. To understand electronic structure, therefore, we must first learn about light. The light we see with our eyes, visible light, is one type ofelectromagnetic radiation. Because electromagnetic radiation carries energy through space, it is also known as radiant energy. There are many types of electromagnetic radiation in addition to visible light. These different types—radio waves that carry music to our radios, infrared radiation (heat) from a glowing fireplace, X-rays—may seem very different from one another, but they all share certain fundamental characteristics. All types of electromagnetic radiation move through a vacuum at 3.00 × 108 m/s, the speed of light. All have wavelike characteristics similar to those of waves that move through water. Water waves are the result of energy imparted to the water, perhaps by the dropping of a stone or the movement of a boat on the water surface ( FIGURE 6.1). This energy is expressed as the up-and-down movements of the water. FIGURE 6.1 Water waves. The movement of a boat through the water forms waves that move away from the boat. A cross section of a water wave ( FIGURE 6.2) shows that it is periodic, which means that the pattern of peaks and troughs repeats itself at regular intervals. The distance between two adjacent peaks (or between two adjacent troughs) is called the wavelength. The number of complete wavelengths, or cycles, that pass a given point each second is the frequency of the wave. FIGURE 6.2 Water waves. 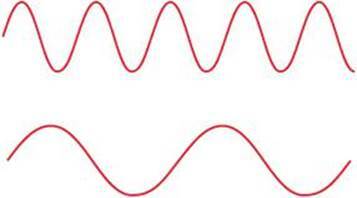 The wavelength is the distance between two adjacent peaks or two adjacent troughs. Just as with water waves, we can assign a frequency and wavelength to electromagnetic waves, as illustrated in FIGURE 6.3. These and all other wave characteristics of electromagnetic radiation are due to the periodic oscillations in the intensities of the electric and magnetic fields associated with the radiation. 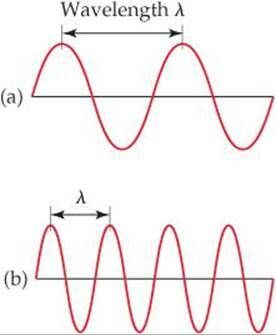 If wave (a) has a wavelength of 1.0 m and a frequency of 3.0 × 108 cycles/s, what are the wavelength and frequency of wave (b)? FIGURE 6.3 Electromagnetic waves. Like water waves, electromagnetic radiation can be characterized by a wavelength. Notice that the shorter the wavelength, A, the higher the frequency, v. The wavelength in (b) is half as long as that in (a), and the frequency of the wave in (b) is therefore twice as great as the frequency in (a). where c is the speed of light, λ (lambda) is wavelength, and v (nu) is frequency. Why do different types of electromagnetic radiation have different properties? Their differences are due to their different wavelengths. FIGURE 6.4 shows the various types of electromagnetic radiation arranged in order of increasing wavelength, a display called the electromagnetic spectrum. Notice that the wavelengths span an enormous range. The wavelengths of gamma rays are comparable to the diameters of atomic nuclei, whereas the wavelengths of radio waves can be longer than a football field. Notice also that visible light, which corresponds to wavelengths of about 400 to 750 nm (4 × 10–7 m to 7 × 10–7 m), is an extremely small portion of the electromagnetic spectrum. The unit of length chosen to express wavelength depends on the type of radiation, as shown in TABLE 6.1. How do the wavelength and frequency of an X-ray compare with those of the red light from a neon sign? FIGURE 6.4 The electromagnetic spectrum. Wavelengths in the spectrum range from very short gamma rays to very long radio waves. Frequency is expressed in cycles per second, a unit also called a hertz (Hz). Because it is understood that cycles are involved, the units of frequency are normally given simply as “per second,” which is denoted by s–1 or /s. For example, a frequency of 820 kilohertz (kHz), a typical frequency for an AM radio station, could be written as 820 kHz, 820,000 Hz, 820,000 s–1, or 820,000/s. Two electromagnetic waves are represented in the margin. (a) Which wave has the higher frequency? (b) If one wave represents visible light and the other represents infrared radiation, which wave is which? (a) The lower wave has a longer wavelength (greater distance between peaks). The longer the wavelength, the lower the frequency . Thus, the lower wave has the lower frequency, and the upper wave has the higher frequency. 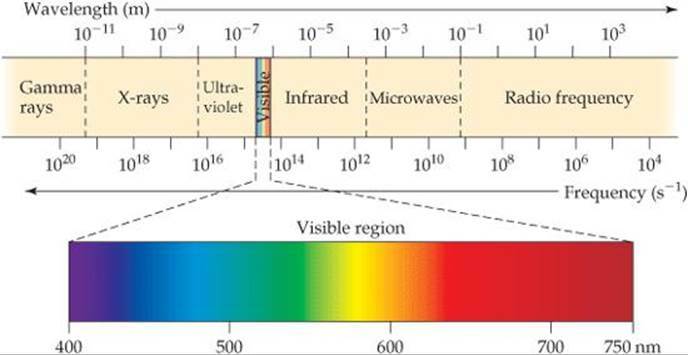 (b) The electromagnetic spectrum (Figure 6.4) indicates that infrared radiation has a longer wavelength than visible light. Thus, the lower wave would be the infrared radiation. If one of the waves in the margin represents blue light and the other red light, which is which? Answer: The expanded visible-light portion of Figure 6.4 tells you that red light has a longer wavelength than blue light. The lower wave has the longer wavelength (lower frequency) and would be the red light. How do we know that light has a finite speed and does not move infinitely fast? During the late 1600s, the Danish astronomer Ole Rømer (1644-1710) measured the orbits of several of Jupiter's moons. These moons move much faster than our own—they have orbits of 1–7 days and are eclipsed by Jupiter's shadow at every revolution. Over many months, Rømer measured discrepancies of up to 10 minutes in the times of these orbits. He reasoned that the discrepancies occurred because Jupiter was farther from Earth at different times of the year. Thus, light from the Sun, which reflected off Jupiter and ultimately to his telescope, had farther to travel at different times of the year, implying that light travels at a finite speed. Rømer's data led to the first estimate of the speed of light, 3.5 × 108 m/s. Since Rømer's time, increasingly sophisticated techniques have been used to measure the speed of light. For example, in 1927, A. A. Michelson (1852-1931) set up a rotating mirror at the top of Mount Wilson in California. The mirror bounced light to the top of Mount San Antonio, 22 miles away, where another mirror bounced the light back to Mount Wilson. Michelson was able to change the speed of the rotating mirror and measure small displacements in the position of the reflected spot. The value for the speed of light (in air) based on this experiment was 2.9980 ± 0.0002 × 108 m/s. The main source of error was the distance between the mirrors, which was measured within a fifth of an inch in 22 miles. By 1975, the measured value was even more precise, 2.99792458 ± 0.00000004 × 108 m/s (in vacuum), the error being mostly due to the uncertainty in the length of the meter. In 1983, the meter was redefined based on the distance that light travels in vacuum in one second. As a result, the value for the speed of light became a fixed, exact quantity, c = 2.99792458 × 108 m/s. 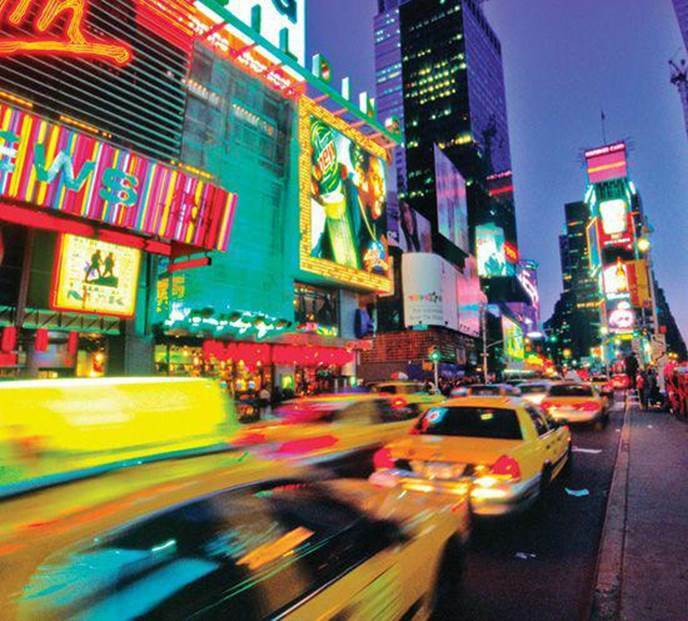 The yellow light given off by a sodium vapor lamp used for public lighting has a wavelength of 589 nm. What is the frequency of this radiation? Analyze We are given the wavelength, λ, of the radiation and asked to calculate its frequency, v.
Check The high frequency is reasonable because of the short wavelength. The units are proper because frequency has units of “per second,” or s–1. (a) A laser used in eye surgery to fuse detached retinas produces radiation with a wavelength of 640.0 nm. Calculate the frequency of this radiation. (b) An FM radio station broadcasts electromagnetic radiation at a frequency of 103.4 MHz (megahertz; 1 MHz = 106s–1). Calculate the wavelength of this radiation. The speed of light is 2.998 × 108 m/s to four significant digits. Our bodies are penetrated by X-rays but not by visible light. Is this because X-rays travel faster than visible light?